As the highest point of the house, your chimney is susceptible to a variety of stresses – both from the climate and from structural movement – which can often result in loose bricks, cracks or damaged flashing. We’re on hand to tackle these kind of problems, so get in touch and we’ll help you out. We’re a great choice to carry out your repairs. We have the staff and the expertise to get it done just how you want. Our friendly team performs to the highest standards, but you won’t have to pay through the nose – our prices are really competitive. Wherever you are in Leicester, simply call us now on 0116 316 9544. After you speak to us, we’ll come over, have a look at your problem, discuss what needs doing, and then give you a completely free quote. It’s then up to you if you want to go ahead and use us to do the job. 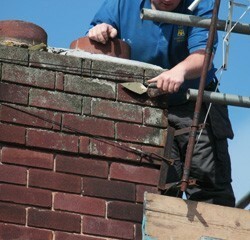 Our approach of putting you first means we’re among the city’s top chimney repair experts. Speak to us now for more information.